We aim to minimise the impact our activities and facilities have on the woodland environment. Weasenham woods is the oldest example of continuous cover forestry in the British Isles. Get away from the crowd and enjoy time in a truly beautiful woodland surrounding. 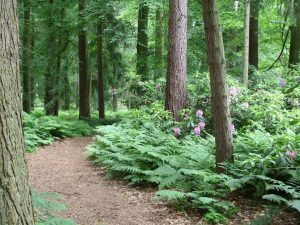 Follow our woodland walk and learn about all the different species of trees and flowering shrubs. A charge of £3.00 is made for adults undertaking the course. We have some posts on the ExTREEme blog regarding the New Wood at Weasenham. We do have a hard standing car park for up to 50 cars. We do not charge for car-parking at ExTREEme. 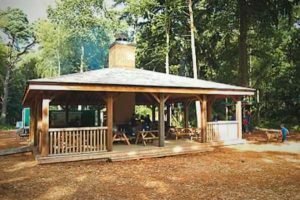 We have a magnificent covered picnic pavilion or club house, constructed using timber from the wood and milled on the estate, with a roaring open log fire for shelter and dining. After you’ve tried all the fun, enjoy chatting about your experiences in our Woodland Cafe. Food and refreshments are available to purchase at our café. We have separate male and female trailer toilets on site.